From its inception in April 1970, Earth Day has expanded into an international celebration, and each year, the festivities have a theme. In a state passionate about enjoying and preserving its enviable wilderness, Montana is awash with quirky events and fulfilling opportunities in wildlife appreciation, volunteering, conservation and charity. And where better a place to spend Earth Day than in a truly wild state—embedded in the evolving West, rooted in the forest and field. Below are 10 places to celebrate ‘ol Mother Earth, Big Sky-style. Always a locus of wildlife education, volunteerism, guest speakers and nature-centric events, on the Earth Day, the Audubon Center is especially worthwhile. One can choose to hear a lecture on nature stewardship or plant identification, or get a little dirtier planting trees and flowers, landscaping, and collecting garbage & recycling. Families are welcome, and there are plenty activities for kids. After an hour or two of giving back, hang around the center for a free BBQ. Experiencing wildlife face-to-face is a singular experience: Humbling and humanizing and wonderful. And Earth Day is well spent absorbing information and interacting with Montana fauna. The modern and well-maintained center is part animal rehabilitation and preservation center, part museum, part game reserve. This venue is ideal for viewing wildlife close up—grizzlies, raptors, beavers, etc.—and learning about their role as cogs in the ecosystem. There’s an on-site pond, aviary and massive enclosures to view several species, and classes and lectures are available for kids. Montana wild distills and engenders the most admirable facets of Earth Day: Education, involvement, conservation and passion. An off-shoot of the Youth Conservation Corps, this chapter lives and breathes conservation, year-round. The state’s vibrant environmental culture is at a confluence of pristine wilderness and expanding suburbia, brimming with passionate residents and university students. The Corps offers numerous volunteer and intern positions for college and high school-age citizens, and for Earth Day, associations in Billings, Missoula and Bozeman endeavor to plant trees and host events for education and recreation. Check website for details. The weather is often pristine in late April. It’s a refreshing commingling of icy mountain air and warming spring sunshine that makes a light run enjoyable. Each year, Missoula and several other Montana towns host charity runs/marathons. Routes in are easy on the joints and welcome to all ages and skill levels. Proceeds go to any number of local green nonprofits, and the snaking path through downtown gives runners and onlookers a good taste of local Missoula shops, restaurants and watering holes. Give a little sweat to mother earth, and then refill the tank with heaps of healthy eats at Worden’s Market or Biga Pizza. Hosted by Carroll College, last year’s expo was a complete and entertaining weekend—the place to be on Earth Day. This year, be one a passionate tree-hugger or a layman looking for a day in the sun, there’s something for all: Live music, food vendors, tree-planting, educational lectures, volunteer opportunities, charity raffles, et al. Kids can entertain themselves with arts & crafts workshops while the impassioned can join an eco-project. Bozeman possesses a compound liberalism—it’s an eclectic college town, with the unique addition of celebrity and ranch-magnate money. This spawns a petri dish of environmental and conservationist outlets, welcome to visitors during Earth Month. Food stands, volunteer sign-ups, animal demonstrations and student-led tree plantings abound throughout April. An enjoyable weekend is spent strolling Main Street, then the Montana State University campus, hopping from storefront to storefront like a tree-hugging honeybee, perusing eco-stands, getting involved in Earth Day activities and dining at local eateries. Remember that eating local—in its truest sense—is always more environmentally-friendly. It seems only appropriate to spend Earth Day in nature, and the views from anywhere around this mini-ocean are truly singular. After the Great Lakes, Flathead is the largest natural freshwater body in America. As the snowmelt begins in April, the campgrounds and greener vistas are just emerging—a rare glimpse of landscape in transition. There’re few roadsides in Montana that aren’t postcard-worthy, but Flathead provides a well-rounded list recreation: Hiking, camping and lakefront property with amenities. But, it’s Earth Day. Make a conscious effort to reduce consumption and waste: Carpool to the lake, canoe, don’t motor-boat, make a healthy donation at the area Forest Service station and maybe give the fish a day off. If becoming acquainted with history is of any interest, each American should visit an Indian Reservation. And Earth Day is an appropriate occasion to do so. After all, the very earth upon which the holiday is celebrated originally “belonged” to First Nation peoples. More importantly, tribes have had an incomparable connection with the land, possessing an enlightened perspective on the relationship of humankind and nature—a wealth of lessons can be distilled from this symbiosis. With seven reservations, and hundreds of landmarks and battlefields statewide, an adequate spot is unavoidable. And don’t think it’s all somber—the reservations have reduced prices on gas and goods, amazing handmade textiles, and a fry-bread taco is a thing of beauty. It may not be a vacation, but “adopting” a stretch of asphalt literally cleans-up the planet. It’s surprisingly rewarding spending a few hours, on a sunny April day, getting exercise, collecting refuse and improving the appearance and health of the landscape. The service also earns a highway sign emblazoned with one’s organization and completion certificates to show friends (or as a tax write-off). Montana employs 11 area coordinators responsible for divvying-out highway adoptions and providing vests, trash bags and safety training. 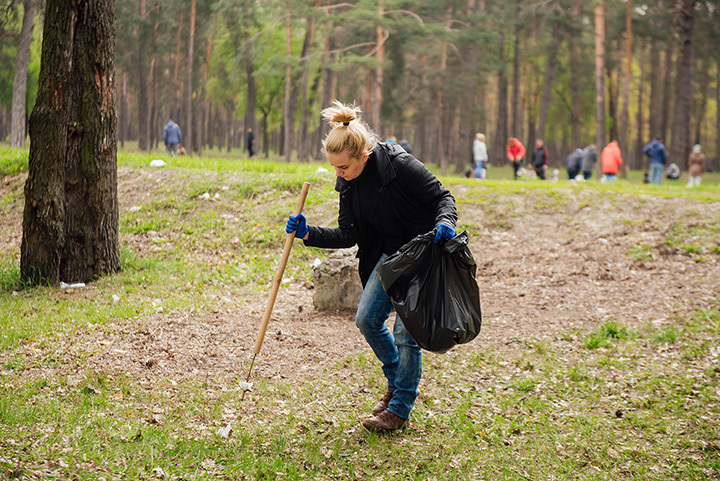 Planting trees, volunteering, picking up garbage, reducing consumption & waste, and educating oneself are all excellent means of contributing on Earth Day. But the most important changes, the most monumental, descend from legislation. Aside from celebrating the majesty of our planet, the reason for Earth Day derives from concern for a threatened environment. And the best means of remedying this situation—to alleviate that concern—is institutional change.